Qorvo®, a leading global supplier of core RF building blocks, is helping designers solve the complex problem of interference as they create devices and networks for use today and for the world of 5G. 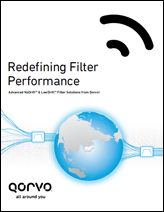 As band counts rise and best-in-class filter performance is required, Qorvo is leveraging its advanced filter technologies, such as LowDrift™ and NoDrift™ bulk acoustic wave (BAW) and surface acoustic wave (SAW), to help tackle the industry's toughest interference problems. Qorvo's LowDrift™ and NoDrift™ BAW and SAW filter technologies achieve breakthrough performance by dramatically reducing temperature sensitivity, resulting in improved insertion loss, longer battery life, fewer service disruptions and dropped calls, and an enhanced user experience. 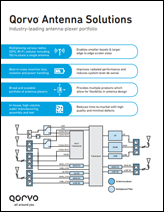 Discrete Filters/Duplexers – Premium filter products offer compliance to the toughest spectrum challenges and meet antenna Power Class 2 requirements. 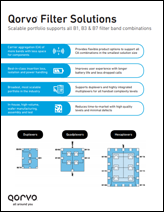 Multiplexers – High-Q BAW enables best-in-class multiplexer performance and simplifies regional carrier aggregation implementations. Carrier aggregation (CA), 4x4 DL MIMO, HPUE, CBRS and LAA are growing across the world. The number of 4G LTE frequency bands is increasing. We are also moving into an era of downlink CA beyond 5 Component Carriers (CC). High Performance UE (+26 dBm) usage is expanding as is LAA (Licensed Assisted Access) in unlicensed 5 GHz spectrum enabling small cell densification. The U.S. is about to embark on 3.5 GHz in shared spectrum, Citizens Broadband Radio Service (B48 CBRS), which will enable expansion of private LTE networks and neutral hosts. 2018 will bring the rollout of the FirstNet B14 LTE system for first responders, which will be available for usage in consumer cell phones where spare capacity exists. 3GPP has approved the first 5G New Radio (New Radio) Specification (38.101) using an LTE anchor in a Dual Connect configuration of LTE and 5G systems, called non-standalone (NSA NR). 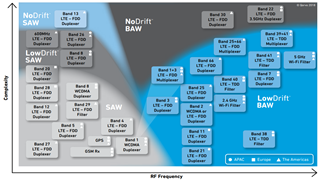 5G will initially use FR1 (Frequency Range 1, <6 GHz) bands n28, n41, n71, n77, n78 and n79; then mmWave FR2 (Frequency Range 2, >6 GHz) band n257 (28 GHz); and followed by n260 (39 GHz).